Being a science journalist can be a difficult task. Every day new articles about new research are being published, and the primary job of a science journalist is to translate that newly published research into something consumable by whomever the intended audience is for whatever journal or website or newspaper they’re working for. And they have to do this translation from jargon into common speak with research they themselves might have no particular knowledge about; a science journalist might be expected to be able to deliver articles about physics and chemistry and geology and astronomy and biology and medical science, each of which has its own piles of jargon. Each of those subjects is something that authorities are expected to spend years learning, whereas science journalists are expected to learn the basics of scientific fields (and the task of learning how to communicate those basics to a non-technical audience) in their not-so-ample free time. So it’s possible to be entirely out of one’s depth. That’s okay. It will happen, and the more pertinent question will be how an individual journalist responds when they make an uh oh. Because they can respond with a mea culpa wherein they acknowledge that they made an uh oh, or they can pass the blame on to someone else. This is about an example of the latter, because that’s funnier, but I have to give a short anatomy & physiology lesson first. You have sensory organs all over your body. But all the hearing and balance detection you have ever done has occurred inside your head. They’ve occurred inside these structures informally called the inner ears, and the inner ears (they’re bilaterally symmetrical, you have a left and a right) are usually discussed as three adjacent sections. In this illustration, there’s a top left, a middle, and a bottom right section. On the top left are the semicircular canals. Different researchers use different terms for each of the canals but the main point is that there are three that are roughly aligned with the three dimensions of space that we move through. The sensory cells for the semicircular canals are inside the ampullae, those ‘bumps’ where the ‘hoops’ connect to the rest of the inner ear; the hoops contain a fluid (it’s an extracellular fluid, a fluid inside your body that’s not within the cells) which moves when your head moves, this fluid pushes sensory cells inside the bumps, that ‘being pushed’ sensation is what is transmitted via the vestibular component of the vestibulocochlear nerve to the brain. If you tilt your head to the left, the fluid inside the canals is moved in a particular way, those signals (the left and right sets of canals both create a signal) are sent to the brain, and your brain interprets the signals. Confusion (and potential nausea) is caused when that interpretation is in conflict with itself (when your body is being rapidly jarred back and forth) and/or signals from your retinas; if you’re on a carnival ride and you keep your eyes shut, you are less likely to lose your lunch. The middle section is the vestibule; it has two organs inside of it (the utricle and saccule) which also detect acceleration but with a slightly different anatomical setup. E.g. they use otoliths (“ear stones”), which are crystalline structures, as part of the acceleration sensory device. You have “rocks” inside your head, don’t be concerned. The bottom right section is the cochlea. 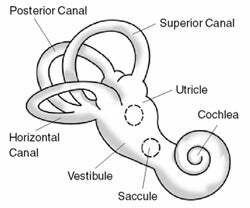 Vibrations travel through the air, these vibrations hit a series of structures in your middle ear and cause them to slightly vibrate, those vibrations hit the fluid inside your cochlea, and sensory cells inside the cochlea detect vibrations inside the fluid. Those cells send a nerve impulse down the cochlear component of the vestibulocochlear nerve. There’s a range of frequencies of vibrations that your sensory cells can detect but there’s also frequencies that are slower or faster than your cochlea can notice; dog whistles create high frequency sounds which are audible by dogs but not humans. When I saw that a Gizmodo author was writing about this anatomy poorly, I used the website’s search function to see how systemic the problem is. I found one example of an author doing pretty good. Adam Clark Estes probably learned the anatomy from his own medical history of having hearing problems, and his article about becoming a cyborg* discusses middle ear anatomy. I found myself always retreating into music, because good ear buds would pump sound waves straight past my broken ear drums, past those tiny bones, and straight to my brain by way of the auditory nerve ... The problem, in a sense, was a mechanical one. Your eardum and ossicles (a.k.a. “those tiny bones”) exist to conduct sound waves from outside the ear to the auditory nerve in your inner ear, the same way that a bridge carries cars from one side of the river to the other. He even included an image. He could have used more formal terms, but he’s writing a medical technology article, so he felt like he could be informal. That seems legit to me. Alex Cranz did okay in an article about Virtual Reality. How you experience your place in the physical world is determined by your eyes and your vestibular system, which is primarily composed of a complex series of bone structures in your inner ear. Spinning quickly in a circle or standing up too fast can wreak havoc with this delicate arrangement. Damage to the system creates vertigo. It’s hyper sensitive and does not like to be tricked—yet that’s exactly what VR does. This is half right because the inner ear is more than just a bone structure (the simplest wording is that it is sensory organs inside bones), but otherwise this is a really quick description of how our sensory organs can be tricked. I have to grade this writing as merely okay because it was categorized as a science article; if you file an article as a science article but then talk inaccurately about science, you aren’t communicating science well. I already wrote about a previous Ryan F. Mandelbaum article, so I won’t return to what about that article I found particularly frustrating, but looking back it strikes me as a warning sign that this particular author doesn’t really get inner ear anatomy. It’s written just wrong enough to broadcast that the author appears to be uncomfortable with the topic. Four and a half months later, the lack of comfort became very evident. On the afternoon of December 29th, Gizmodo’s Twitter page uploads a video: “How Does Alcohol Affect Balance?” It’s a short video clip, a mixture of original animation and original live-action film, of an expert (Dr. Rob DeSalle, Curator of Entomology at the American Museum of Natural History, among other positions) discussing how alcohol affects balance. Dr. DeSalle’s explanation is prefaced by Ryan F. Mandelbaum providing a short narration. I would embed the video here but Kinja doesn’t like Twitter scripts, so here’s the tweet, which has the video, which was very thoughtfully transcribed and which I’ll transcribe a copy of. RYAN F. MANDELBAUM: That swaying feeling you get when you’re drunk? Well, you might think that that’s just the alcohol messing with the motor control centers of your brain. But that’s not the whole story. Just like hearing, balance works in your ears. But rather than picking up vibrations, you feel it through hairs that react to the movement of the fluids in your inner ear. ROB DESALLE: It’s actually kind of a 3-dimensional coordinate system. Your semicircular canals, there’s 3 of them – one on the x-axis, one on the y-axis, and one on the z-axis. If you tilt your head this way, the fluid will go this way, and it’ll pull the hairs this way. And that’s sending signals to your brain, telling you where you are in space. When you drink alcohol, it gets in your blood system, right? It goes to your brain. But it also goes to your inner ear, and seeps into your semicircular canals. Those hairs swell up, and signals are sent to your brain that mess up your sense of balance. And so, the room will start spinning. There are two errors in what Rob DeSalle is saying. One is a bit technical. He says that the semicircular canals “tell you where you are in space.” That sense (proprioception) is not 100% the same sense as balance/equilibrium and the vestibular system doesn’t really report on where parts of your body are in relation to one another. Your inner ears do not provide any sensory data from anything but themselves, and they report on when your inner ears change their relative velocity. Yes, sure, that is related to where the head is in position to the Earth (or if you live on Mars, Mars), but proprioception involves quite a bit more than just the inner ear. The other error is that he erroneously describes how alcohol affects the vestibular system by saying that it causes “those hairs” (the sensory cells of the semicircular canals) to “swell up.” From every piece of research I’ve ever seen, the general conclusion is that alcohol slightly changes the fluid mechanics of the extracellular fluid inside the semicircular canals. Because the vestibular system works via mechanical ‘pushing’ on sensory cells, and the fluid is changed enough to make it ‘push’ differently, your brain gets different signals than what it is used to, which causes dizziness or nausea or vertigo. The animation within the video also makes an error. About 45 seconds in, the video zooms into the semicircular canals and shows a cut-out view into the canal. In this view, the canals are lined with hair cells. Those are not where the hair cells are. This is where the hair cells are, according to free anatomy and physiology educational resources that are available online for anyone who wants them, such as science journalists. So the video becomes the basis for an article. Balance is controlled by a surprisingly complex system. Inside each of your inner ears, three hair-lined tubes form a sort of three-dimensional matrix. Fluid fills the tubes, and the movement of the fluid on the hairs sends signals to your brain to tell you how you’re oriented in space. But alcohol doesn’t just enter your brain—it enters your bloodstream and your inner ears, too. It swells the hairs inside those tubes, which messes with the signals that your brain receives. That can cause you to feel like the room is spinning, molecular biologist Rob DeSalle explained to Gizmodo. He recently curated an exhibit called Our Senses at the American Museum of Natural History in New York. These three errors stay in the article from the time of publication until three days later. Three changes occur to the corrected article. But alcohol doesn’t just enter your brain—it enters your bloodstream and your inner ears, too. It changes the blood’s density, causing the inner ear to change shape and the three-dimensional matrix to deform. This changes what the hairs perceive and messes with the signals that your brain receives. That can cause you to feel like the room is spinning. Correction: A previous version of this article incorrectly described how alcohol influences the balance system in the inner ear, as pointed out by commenters. It has been updated, and we regret the error. ROB DESALLE: It’s actually kind of a 3-dimensional coordinate system. Your semicircular canals, there’s 3 of them – one on the x-axis, one on the y-axis, and one on the z-axis. If you tilt your head this way, the fluid will go this way, and it’ll pull the hairs this way. And that’s sending signals to your brain, telling you where you are in space. When you drink alcohol, it gets in your blood system, right? It goes to your brain. But it also goes to your inner ear, and seeps into your semicircular canals. RYAN F. MANDELBAUM: The alcohol changes your blood’s density, which deforms the inner ear, and those canals. That changes the signals sent to the brain, and the room will start to spin. I mentioned earlier that the December 29th video, and the December 31st text, had three erroneous claims. The January 3rd correction fixes error #2. It does nothing to fix errors #1 or #3. More amusingly it adds two more errors. Blood isn’t the fluid in the inner ear, and the change in the fluid inside the inner ear doesn’t change the shape of the inner ear (in most vertebrates, the inner ear is contained within bone; it’s not really capable of changing shape once the bone around it ossifies…) or cause it to deform. When alcohol hits the blood stream it is transported all over the body, including to the ear. Blood laced with alcohol has a different density than its teetotaling counterpart and thus distorts the shape of the inner ear. This is close to what happens. Really close. But it’s wrong. But Ryan didn’t know that it’s wrong, so he just paraphrased it, and his “correction” is wrong because he paraphrased someone who was wrong, and he “corrected” an article with three errors into an article with four errors. So there’s a series of errors that get made. Some of these errors seem to occur because an expert said something wrong, and then more errors occur when a member of the Gizmodo staff tries to correct for the expert’s mistake. Both of these situations are things that happen! Sometimes an expert doesn’t prepare well enough for an interview and they say something that’s wrong, and the people interviewing them don’t notice that the thing stated was wrong. This happens, particularly with authors who are not familiar with the subject matter being discussed. On a website with strong editorial control, an editor might choose to take responsibility for the errors that their staff make. At Gizmodo, the science editor is Rose Pastore (no Kinja profile found) and the Editor-in-Chief is Kelly Bourdet (no Kinja profile found) and there is also Deputy Editor Mario Aguilar and there is Senior Editor Adam Clark Estes and don’t forget Senior News Editor Harrison Weber and what about News Editor Hudson Hongo and Senior Editor Jennings Brown and also Senior Reviews Editor Alex Cranz and last but not least Features Editor Marina Galperina. I included all of these links in case anyone else wants to look through their Kinja comments and tweets to see if any of them said ‘Sorry about that dizzy drunk article.’ But none of the nine Gizmodo (!) editors appear to have taken any form of responsibility for the errors in the video or the article. I don’t think that’s very odd, they probably have other things to worry about. So it’s up to the author to take responsibility. Ryan partially does, but he also kind of doesn’t, because he at least partially chooses to blame the expert, both on Kinja and on Twitter. thanks to everyone who pointed this out. the source in the video gave an incorrect explanation which was reflected in the text. I’ve updated. In addition, the article’s second published draft intentionally removed a text reference to Dr. DeSalle and to the museum exhibit Dr. DeSalle had contributed to. All of this, to me, seems to be an incredibly odd series of actions for a science writer. Unless Dr. DeSalle intentionally presented wrong information, he made an honest mistake. So why does he get thrown under a bus? This author usually tries to do better. Just reading around on Ryan’s Twitter I see that he tries to contact at least two experts when he writes an article. hey: writing about physics is hard. while reading the paper, i often have to look up every concept in a sentence. then i usually call at least two physicists to explain it, and call them again later to make sure my explanations are correct—usually this leads to further tweaks. And in his Gizmodo writing he claims that the process of writing good science journalism isn’t that hard, it just requires talking to experts. It’s really not that hard to write a science news story, I promise. Some new scientific results come out, you talk to a scientist on the phone and ask them what they did, then you ask a few other people who know about the research if the results made sense. It’s a lot like, well, any other reporting. This all leads me to conclude that a rush to publish (maybe because Gizmodo wanted a video) caused a science writer to not be as diligent as they usually are. It’s really quite unfortunate that what could have been an entertaining and informative article and video on a topic that humans have interest in became a bit of a mess. *I’m not 100% sure that Adam Clark Estes became a cyborg. The “cyb” part of the word requires that the prosthetic is able to be controlled with some kind of prosthetic-nervous system connection. Maybe his can be? But if it can’t (if the prosthetic is not able to be controlled by his nervous system) then he’s not a cyborg, he’s an augmented or enhanced human.